Brochures have now gone out to recent and returning customers. If you would like a hard copy of our 2015 High Point Holidays Walking Holiday Brochure, please go to the Contact us page and fill in your details, selecting "order a brochure" in the drop-down menu, and we will send you a copy by post. The Brochure can be viewed on our online brochure page. Our latest competition comes courtesy of Cicerone publishing and it's their updated guides for Provence: Walking in Provence - East and Walking in Provence - West by Janette Norton. This walking holiday explores Brittany's most impressive coastlines from the historic walled town of St Malo to the stunning cliffs of the Frehel peninsula. This walking holiday explores the Calanques National Park where gleaming white limestone cliffs form a stark contrast with the deep blue sky and the turquoise Mediterannean sea. See Brochure Cover. This easy to moderate walking holiday lets you discover a pretty landscape covered with vines, lavender, orchards and forests. This holiday takes a beautiful circuit around the hills, gorges and historic villages of the Luberon Regional Park in Provence. This walking holiday explores a number of wonderful hill-top villages, known as bastides, with the picturesque backdrop of rolling fields and vineyards. This holiday takes a tour around Mont Aiguille in the Alps, an area of deep gorges and canyons, gigantic cliffs and rocky plateau. 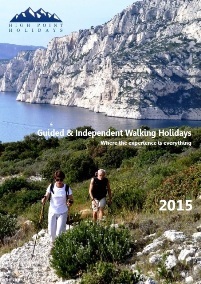 2015 High Point's Walking Holidays Brochure is now available to view online and all our Guided Walking Holiday dates for 2015 are now available on this site. Congratulations to R Stanley, Shrewsbury on winning England's 100 Best Views. 7 out of the 100 views are featured on our UK self guided walking holidays: Tintagel on Cornwall's Dramatic Northern Coast; Chesil Beach, Lulworth Cove, Lyme Regis and Corfe Castle on Dorset Jurassic Coast Path & Ridgway; and Salisbury and Shaftesbury on Wonders of Wessex. Brochures are currently in preparation for 2015. If you request a brochure you will get 2014 version at present so, if you only want a new version when printed, please let us know in your request. As soon as the new one is completed it will go online as well. Still places left on our Guided Walking Holiday Burgundy: Historic Walks in Chardonnay for 19th - 25th October 2014. This is a 6 nights, 5 days walking version of this holiday. 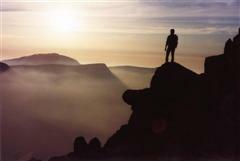 It is single centre based and the price of £655 includes all breakfasts, 5 lunches and 4 evening meals. Accommodation is at Cote Vigne. Our Autumn Newsletter is now available to view online. It centres on Burgundy, looking at our last Guided Walking holiday of 2014 as well as the historic town of Brancion and a glimpse of the latest blog, Walking as Natural Exploration. Our latest blog discusses walking groups and how they can help or hinder your Natural Exploration. August's Newsletter is available to view online. It focusses on the Alsace with the latest competitions, blogs and more. To our subscribers: Sorry for sending out the newsletter twice, the newsletter software hid some text which was only visible in certain mail formats....unfortunately not mine. So some of you will have seen no difference in the versions and think we've gone mad! So apologies. We've a new competition to win a copy of Speak the Culture: France. If you're going to take a holiday in France this book may help as a fast track to understanding France and the French psyche. Speak the Culture: France dissects the figures, events and habits that have contributed to the country and its people. It’s the guidebook to French culture. Congratulations to A. Lowder, Plymouth and J. Henderson, Oxford on winning copies of Trailblazer's The Walker's Anthology. Latest blog post is a review of Monty Don's book "The Road to Le Tholonet - A French Garden Journey." We share with you some of his thoughts on France and walking. Congratulations to the winners of our competition to win a copy of Monty Don's "A French Garden Journey": K.Hartley, Sheffield; S.Broadley, Surrey; and L.Deller, Bedfordshire. July's edition of our Highlights Newsletter is available to view online. This month focusses on the Jura region. New competition: A copy of the beautiful Simon Jenkins book "England's 100 Best Views" to give away. Our latest blog post is a book review of Wink Lorch's book Jura Wine. We purchased this beautiful book through the author's project on the Kickstarter crowd-funding website and we're so glad we did. A more comprehensive book on Jura Wine, you will not find. Our June edition of 'Highlights,' our monthly newsletter is available to view online, you can sign up to receive it on our e-newsletter page. Latest competition is now available to enter. We have 2 copies to give away of The Walker's Anthology courtesy of Trailblazer publications. A great little compilation of writings of more than 50 literary figures. Our sincere apologies to the handful of people who were recently in receipt of our brochure, but with the inconvenience of it being sent without enough postage paid; an oversight following recent Royal Mail price rises. Recompense has been forwarded to the affected customers. Congratulations to B. Marlow, S. Tyson, I. Howells & E. Moore, winners of our Outdoor Photography and Walking the Hexagon books. Apologies for the delay in finalising this competition, books will be in the post this week (w/c 26th May). This month's newsletter is available to view online, it features the Vanoise region of the French Alps and has information on our latest competition and blogs. We have shared some more of our Guided Holiday Photos from last year. You can view some snaps from May's walk in the Jura. This month's new competition is to win one of 3 copies of Monty Don's book A French Garden Journey - The Road to Le Tholonet. In this personal and passionate book, Monty Don shares his knowledge and love of France, through its gardens. Our latest blog is a review of Trailblazer's Guidebook to the Dorset and South Devon section of the South West Coast Path. High Point Holidays offers 4, 6 or 7 day's walking along Dorset's Jurassic Coast - our independent walking holiday follows the South West Coastal Trail between Lyme Regis and Swanage in Dorset. This month's blog looks at Long Distance Footpaths and whether they are worth the compulsion to complete them that some people dedicate and why at High Point Holidays we create walking experiences rather than just provide support for people looking to complete a National Trail as part of a holiday or challenge. 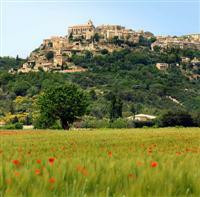 Our Guided Walking Holiday Secret Provence: Les Baronnies is now Fully Booked for the week 21st - 28th June. Our latest newsletter (Spring/April) is available to view online. It focusses on the Mercantour region of the French Alps. Please note our current competitions have been extended until the end of April: We have 3 copies of Cicerone's book Outdoor Photography to give away. See the competition page for details of how to enter, plus we have 3 copies of Terry Cudbird's book Walking the Hexagon to give away. In a year's walking Terry covered the six sides of the French hexagon, discovering the astonishing variety of France's regions; their culture, history, languages, architecture and food. Apologies to those that have already entered, we promise they will end on the new deadline and winners sent out asap afterwards! There won't be a Newsletter sent out this month, we will be sending out a Spring issue in April. 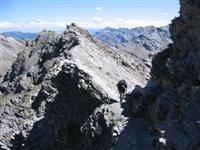 Our Queyras: Best Kept Secret in the Alps Guided walking holiday for 6th-13th July is now Fully Booked. We have added another new page that details accommodation featured on one of our walking holidays in France: Les Jardins sur Glantine is a unique, small guest house with wine cellar located in an 18th century house in one of the main streets of Poligny and has 2 very large, immaculately presented suites. It is used on our self-guided holiday, the Jura Wine Trail. We have a new blog on our site inspired by Mike Parker's book The Wild Rover it looks at Britain's Rights of Way and ideas for exploring your local footpaths. 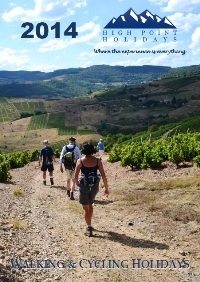 Latest Newsletter has been e-mailed out, it features our self guided walking holidays in the Dordogne and Lot Valleys. We have extended our closing date for the following competition: courtesy of Cicerone, we have 3 copies of their Outdoor Photography book to give away. See the competition page for details of how to enter. For this month's competition we have 3 copies of Terry Cudbird's book Walking the Hexagon to give away. In a year's walking Terry covered the six sides of the French hexagon, discovering the astonishing variety of France's regions; their culture, history, languages, architecture and food. We have added another new page that details accommodation featured on one of our walking holidays in France: Aux Forets is a charming guest house near the town of Charlieu, where you’ll stay on our independent walking holiday - Beautiful Brionnais: Secret Hills of Burgundy. Web page has been added about the village of Semur-en-Brionnais, it sits on top of a ridge with its 10th century chateau St Hughes, the oldest one in Burgundy, overlooking the Burgundy hills. There is plenty to see if you visit this pretty village as part of the self guided walking holiday Beautiful Brionnais: Secret Hills of Burgundy. January's Newsletter has been e-mailed out, it features our Beaujolais Medieval Village Tours, Self Guided 7 nights, 6 days Walking, Self Guided 5 nights, 4 days walking and Guided 6 nights, 5 days walking. New Competition courtesy of Cicerone, we have 3 copies of their Outdoor Photography book to give away. See the competition page for details of how to enter. Review of Prices: As part of our yearly review of our holiday bookings, dates, prices etc, we are delighted to be able to inform you that over half of our French Independent Walking Holidays have remained at the same price as last year and 6 of our 14 scheduled Guided Walking Holidays in France have remained at the same price or cheaper. This walking holiday follows on from our Grand Crus wine trail & traverses a number of pretty valleys harbouring pretty chateaux and quaint villages. This spectacular trail takes you past high alpine lakes, through stunning valleys and along beautiful balcony paths following one of the best sections of the Tour of the Ecrins. This walking tour is located in the heart of the Ardeche Regional Park & includes wonderful heather-clad moutains with great panoramic views; pretty chestnut forests; beautiful rivers and sun parched, vine covered slopes.